My friend Steve posted this link on his Facebook page. 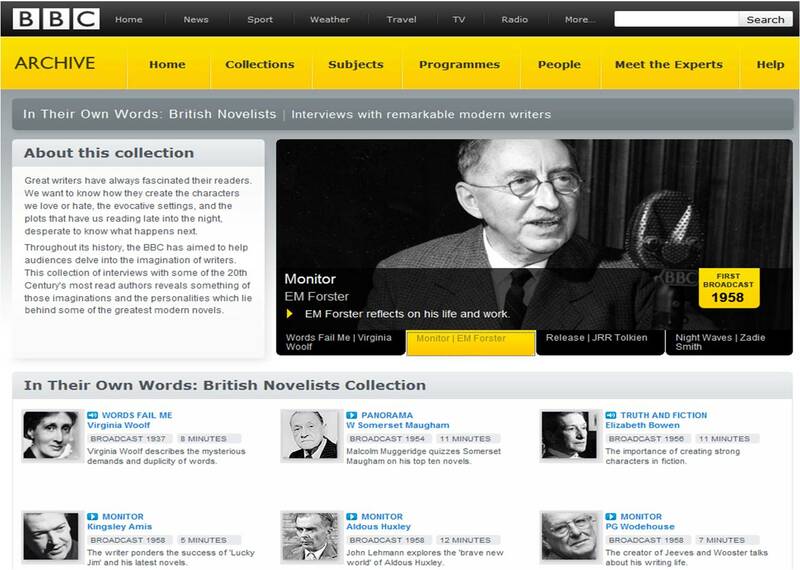 It is a collection of British novelist interviews from the BBC Archives now available for listening online. I can’t wait to listen to these. Check them out here. 8/31 UPDATE: So far I have listened to Maugham, Bowen, Forster, Wodehouse, and Isherwood. They are fascinating, not just because of who is being interviewed, but the formats vary quite a bit as well. And for Spinal Tap fans you might notice that the volume control on the BBC media player goes to “eleven”. Wow, thanks for posting the links, Thomas. I will enjoy listening to these interviews but I know how much you will especially enjoy them and am happy for you. Oh Wow Thomas! I'll definitely be listening to these the moment I get some free time. Thanks for posting! M Denise C: Like a kid in a candy store except everything is free. Daniel: The voices are one of the more fascinating aspects of what I have heard so far. Elocution has evolved (devolved) greatly since most of these recordings were made. Mrs. B: I am sure you will enjoy them. God bless the BBC~well, I heartily agree with you. Darn, how did I miss this? Thank you so much for posting it. I want to listen to Elizabeth Bowen. Thank you so much! I've just stripped off my rubber gloves for a respite from cleaning house and am so excited to have this link to come back to later! Toby: Sometimes I get a little overwhelmed by all that is available online from the BBC. I never quite know what to listen to first. Vintage Reading: I quite enjoyed the Bowen. Seemed more of a lecture than an interview. Darlene: Well I am glad you are taking a break from cleaning. Fabulous! Thanks so much for posting this, I'm off to check it out right now. Amen to that, Thomas: the BBC has it's critics, but I for one think it's one of the best things we Brits ever did! Ash: You will love it. Teadevotee: The Brits have done a few things worth applauding, but I think I would agree it is one of the best.